Is it possible to search MediaWiki sites using regular expressions? 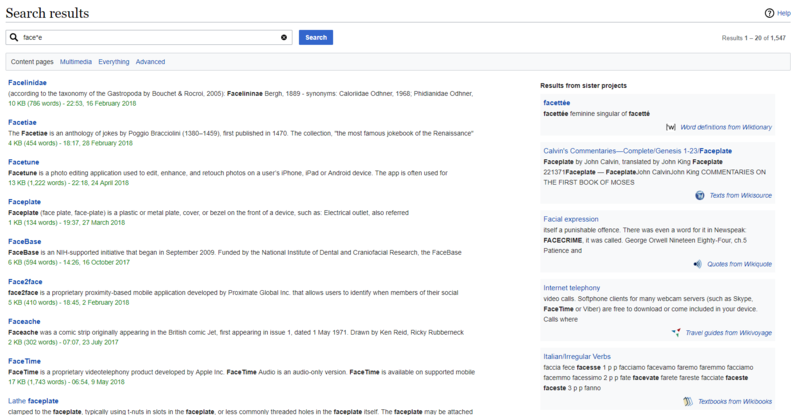 I'd like to search for phrases using regular expressions on sites such as Wikipedia and Wikimedia Commons. Is it possible to do this? It's already possible to do the same on Google (as demonstrated here), so I want to know whether it's possible for Wikipedia as well. It's available and powered by the CirrusSearch (based on ElasticSearch) which is the used search engine in the MediaWiki sites, and the Wikimedia platform. Note: Full guide reference, and source - on Wikipedia: Help:Searching#Search_string_syntax. The search engine supports boolean logic in searches. The logical operators include the "-" (minus sign) character for "logical not", the AND, the OR, and the grouping parentheses brackets: (_). Logical OR must be spelled in capital letters; the AND operator is assumed for all terms (separated by spaces), but capital AND is equivalent. Simple AND, OR: "credit card" OR "payment card", "credit card" AND "payment card" - will work as expected. Suffixed tilde character for fuzzy search ("sounds like") - For example, searching for charlie~ parker~ returns Charlie Parker, Charles Palmer, Charley Parks (up to two character difference, not including the first one). Wildcard search - searching face*e - starts with face and ends with an e with anything in the middle. Read more about the search engine and this extension to unveil their full functionality and features. Not the answer you're looking for? Browse other questions tagged mediawiki wikipedia regex or ask your own question. Is it possible to search Wikipedia including deleted text? Is there a way to search in Google using regular expressions (regex)? Is it possible to include wiki markup in MediaWiki searches? Is it possible to lower the ranking of search results in certain MediaWiki categories with SphinxSearch? Which regular expression flavour is used by the MediaWiki search and replace dialog?